Thunderbird Cafe is what would happen if an eccentric hoarder from Raumati decided to run away to Arizona and start a cafe. Burritos. For a cheap eat, check out $10.50 Ron's Winner Burgers on Thursdays. Thunderbird Cafe is what would happen if an eccentric hoarding artist from Raumati decided to run away to Arizona desert and start a cafe. Much like its sister cafe Sweet Mother's, Thunderbird is a raven's nest of eclectic, fluoro and tacky goods all amalgamated into one cafe, conveniently located in the straight-laced business side of town. A welcome relief, if you ask me. As Thunderbird is a Mexican eatery, I decided to take on the veggie burrito (14.50). It turned out not to be so challenging after all, the grilled flour tortilla filled with cheese, black beans, Mexican rice, coleslaw, shredded lettuce, chipotle mayo, anchiote cream and salsa verde too easily taking a fast Route 66 to my stomach. Still keen, I washed it down with a Snickers milkshake to rival that of Fidel's. 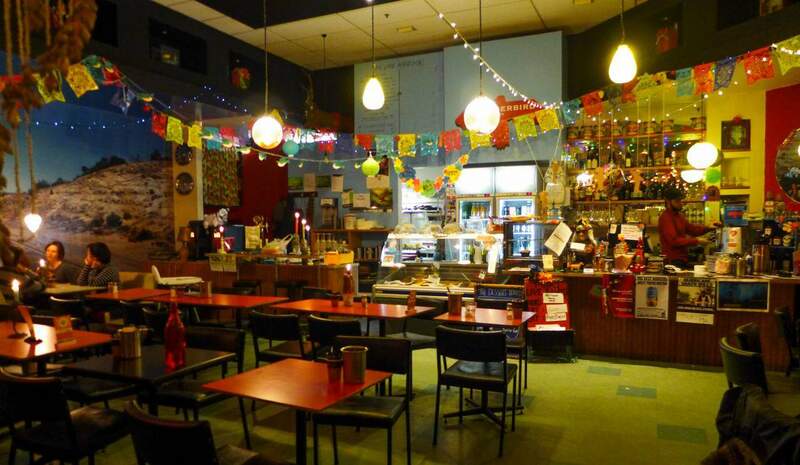 It's pretty darn safe to say that Thunderbird Cafe is easily one of the best cafes in the Thorndon side of town. N.B. Oh, and if you were wondering about the name, yes the cafe owner does have a proud display of little bobblehead Thunderbird action figures behind the counter.